Apricus partner AGS Grup - Solaraterm was featured in Moldovian newspaper Stroika outlining some of their achievements in the local market. Below is a translation into English from the original Russian. To view the original article, please click here. It is no secret that in today's world there is an acute shortage of conventional energy sources. In the foreseeable future will be used only the latest technology and alternative energy sources in all areas of human activity. In Europe, for home heating and hot water for a long time to install equipment that runs on solar energy. Solar water heating systems are used in private homes, apartment buildings, schools, car washes, hospitals, restaurants, agriculture and industry. All of these institutions have something in common: they use hot water. Homeowners and business leaders have been able to make sure that the solar systems for water heating is a cost effective and able to meet the demand for hot water in any region of the world. 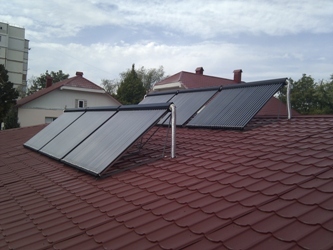 Solar collectors have spread in Moldova. Company S.C. "AGS GRUP" S.R.L. was founded in 2006, a team of professionals with extensive experience, and a great desire to implement the latest technology in alternative energy, making them efficient, but at the same time, simple solutions to improve the lives of people. The main activity of the company is to offer a full range of services in the field of renewable energy and energy efficiency. We provide design, consultation and selection of components, installation and maintenance of all types of installations: solar water heaters, solar photovoltaic modules, ventilation and air-conditioning, heating, biomass, thermal insulation. Over time, the company "AGS GRUP" SRL diversified its activities, specializing in energy audits, feasibility studies, providing solutions for the rational use of clean energy. In 2012, the Project Moldova Social Investment Fund "Promoting sustainable development strategies in the field of renewable energy sources", financed by the European Union, our company, in partnership with an international manufacturer of solar collectors "Apricus Solar Co." Ltd., established 39 autonomous solar systems for hot water in kindergartens, community centers and multifunctional medical institutions in Moldova. Thus, it was the year-round hot water, using clean and renewable energy from the sun, in some cases as an alternative to existing sources of heat, and as the only affordable and absolutely necessary. Among all, it is worth noting the district hospital IMSP Orhei, became the first in the country, whose perinatal center was equipped with solar panels for hot water, and received the award "Moldova EcoenergeticÄƒ 2012" for "Best energy efficiency projects in the public sector." Together, we were able to make an important step in the promotion of solar energy in the Republic of Moldova, which, with the help of the European Union, Moldova Social Investment Fund and "Apricus Solar Co." Ltd., Has its full place on the international map of renewable technologies. We hope that the dense and fruitful cooperation with the Sustainable Energy Financing and energy efficiency in the private sector in Moldova and MoSEFF MoREEFF, more accessible, and we offer technology solutions for individuals and businesses, and our new projects - to bring comfort and convenience to people's lives.